In response to President Trump’s order to review regulations that unnecessarily impede energy development, the Bureau of Land Management announced today that it will consider amending the Desert Renewable Energy Conservation Plan (DRECP) to seek greater opportunities for renewable energy generation. 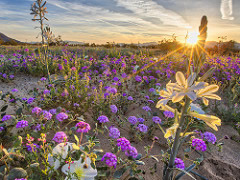 The BLM will publish a Federal Register notice this week to open a 45-day public comment period on the Desert Renewable Energy Plan (DRECP), which covers about 10.8 million acres of BLM-managed public land. On September 14, 2016, the BLM issued the Record of Decision for the DRECP, which made only 7 percent of the area available for renewable energy leasing. President’s Trump Executive Order 13783, “Promoting Energy Independence and Economic Growth,” directs agencies to review all actions that could “potentially burden the development or use of domestically produced energy sources.” A second Executive Order called “Streamlining and Expediting Requests to Locate Broadband Facilities in Rural America” directs Federal agencies “…to reduce barriers to capital investment [and] remove obstacles to broadband services” in order to foster rural broadband. In California, Gov. Arnold Schwarzenegger signed an order in 2008 requiring 33 percent of California’s energy production to come from renewable sources by 2020. More recently, Gov. Jerry Brown Jr. signed into law a measure requiring retail sellers and publicly owned utilities to get 50 percent of their energy from renewable sources by 2030. Renewable energy associations and local governments expressed concerns to the Department of the Interior that the DRECP did not designate enough public lands for future renewable energy development. Furthermore, the Riverside County Board of Supervisors and the Blythe Council said the regulatory burdens created by the DRECP would make projects too costly to build, put undue pressure on private lands, and inhibit economic growth and job creation. These entities recommended a more efficient, streamlined and balanced approach to renewable energy development on both public and private lands. The comments sought in this new Federal Register notice will be used to help set the parameters, or scope, of the review of the Desert Renewable Energy Conservation Plan (DRECP). In particular, the notice asks for comments on how land designations identified in the plan might affect development of solar, wind or other renewable energy resources.